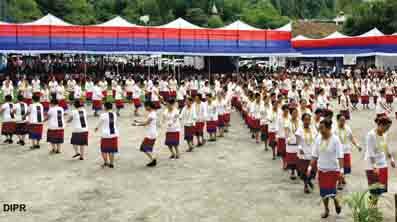 ITANAGAR, Jul 5: Braving heavy downpour, the Apatani community of the capital complex celebrated Dree festival with traditional pomp and fervour at the Dree ground on Thursday. A skit depicting the Dree mythology and how the tribe’s ancestors started cultivating rice was the centre of attraction. The presentation of Daminda dance added more life to the colourful festival. “We have many things to learn from Apatani brothers, right from cultivating techniques to forest conservation culture. Ziro valley is truly a pride of Arunachal,” the DCM said, citing renowned chef Vikas Khanna’s flattering description of his recent visit to the valley. The DCM also asserted that the state government would leave no stone unturned in helping the community preserve its culture and tradition. “The government is putting efforts to ensure early recognition of Ziro valley as a World Heritage Site,” he said. “The Apatani community has made the highest contribution in state-building, especially in human resource development and the education sector. Apatani brothers have produced the highest number of bureaucrats and technocrats in the state,” said Tuki, adding that other communities in the state should learn from the Apatanis. Parliamentary Secretary Techi Kaso applauded the community for zealously guarding its culture. Kaso, who is also the chief patron of this year’s Capital Complex Dree Festival Central Committee, urged the Apatanis to continuously spread communal harmony across the state. Every tribe of the state should have mutual respect for one another, he said. Mein and Tuki later released the festival’s souvenir, along with a Yellow Pages directory, the Dree mythology, and committee songs. Meritorious students of the community were also felicitated. In Ziro, RWD Minister Bamang Felix called for collective effort by the locals to preserve and protect Mother Nature. “The genesis of all our festivals is Mother Nature. She is invoked, appeased and appealed during all our festivals for bountiful harvest and protection of agricultural crops. In return, let us pledge to protect and preserve nature,” Felix said in his address during the 51st central Dree celebration at the Nago Putu Dree ground. He asked the goan buras and buris to be agents of development and assist the government in bringing development to the grassroots level. MLA Tage Taki, Deputy Commissioner Chukhu Takar, Tanw Supun Dukun president Hage Tara, and celebration committee chairman Nani Tani also spoke. In Khonsa, Dree festival was celebrated at the multipurpose community hall. Greeting the people on the occasion, ADC Techu Aran described the Apatani as the most advanced community in the state, and lauded them for preserving their age-old tradition and culture.